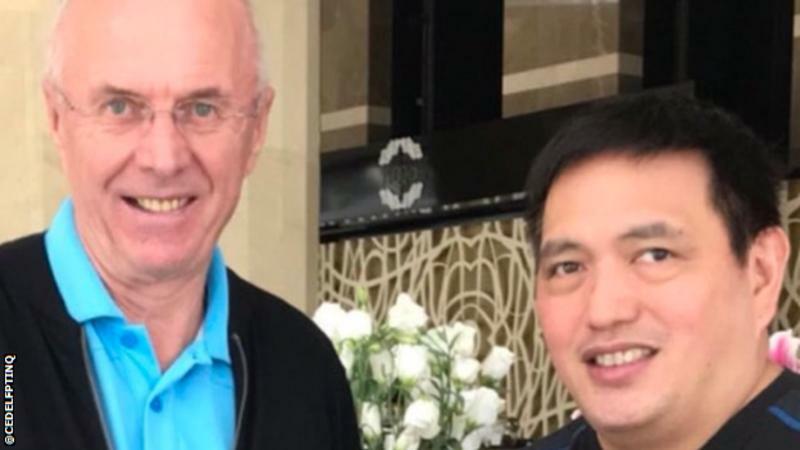 Sven-Goran Eriksson, pictured with Philippines general manager Dan Palami, will take charge of his first game on November 13 against Singapore. Former England football manager Sven-Goran Eriksson is set to take charge of the Philippine national team, the Azkals. The 70-year-old Swede will be in place as head coach to lead the team into next month’s Suzuki Cup and then the finals of the Asian Cup next year. Eriksson is expected to arrive in Manila next week for the team’s training camp ahead of the regional Suzuki Cup, which kicks off on November 8. “One of the most legendary coaches of all time, coach Sven Goran Eriksson, will be coaching the Azkals for the Suzuki Cup and the Asian Cup,” team generals manager Dan Palami said during the Suzuki Cup trophy tour in Manila today (Saturday, October 27). “I’m sure he will be a great addition to the team and I’m sure the players will learn a lot from him. Eriksson takes charge of the team two months after Terry Butcher stepped down from the role without having led a training session. The former England captain was appointed in June only to announce in August that he would not be continuing in the role. Eriksson, meanwhile, has been without a job since being sacked by Chinese second division side Shenzhen FC in June last year. His initial contract with the Azkals runs for six months. Irishman Cooper, who has been in charge of day-to-day affairs since Butcher stood down, will continue in his role. He has previously worked alongside Eriksson at Leicester City. The Philippines face Indonesia, Singapore, Thailand and East Timor in the regional tournament before playing at the Asian Cup finals for the first time next January. There they will meet South Korea, China and Kyrgyzstan at the tournament in the United Arab Emirates.